It is also wise to plan for your health care in advance by using advance directives. A durable health care power of attorney allows you to name a healthcare agent who will have the authority to withhold medical procedures or treatment (including artificial nourishment), review your medical records, issue do-not-resuscitate orders, and pursue legal action to enforce your directives. You may modify the document to restrict any of these powers as well. 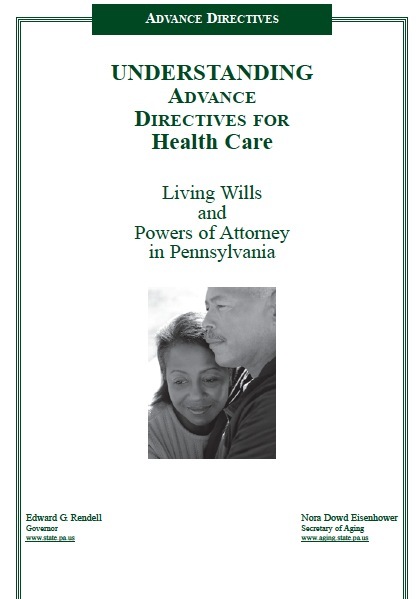 Pennsylvania also allows you to write a living will, which applies to end-of-life scenarios. If you develop an end-stage medical condition that will result in your death, or you suffer from a permanent state of unconsciousness with no reasonable hope of improvement, you can direct that you be given all procedures and medications necessary to alleviate pain and increase comfort. You may also request that all life-sustaining treatment be withdrawn, or you can indicate that you would prefer particular life-sustaining treatments, like dialysis, artificial nutrition, surgery, mechanical breathing, or chemotherapy.